Win a iPad Pro (and More)! Find out more and enter your email below before August 10th for a chance to win! Your Shop Could be Featured! 152 responses to Win a iPad Pro (and More)! Jeez! I love this, bigly! Why in Terms & Conditions, it says “Enter to win by 5pm CT on Friday, 6/26/17.”? Isn’t it to late? Hey there again! The problem has been resolved! You should be getting the right link in there now. Thank you so much for letting us know! Doh! We’re working on fixing that now! That carried over from our previous giveaway – the end date of this one is August 3rd! Thank you for bringing this to our attention! Wait, why does it say the contest ends on the 10th? Does it end on the 3rd or 10th? We extended it a week. Just please let me win. Oh man winning this would change my life, it’s like the package of my dreams! My wife would love this setup. Creativity shouldn’t be hampered by a lack of tools or money – yet in the real world – great tools help to make great art. This prize is life changing ! Boy would I love this … My fingers are crossed … Here’s to HOPING. Holyy grail!! I would be in joy & forever grateful if I ever win. It’s a life changing to be able to help achieve every artist dream. Thanks for the opportunity to win this nice prize! I would love to upgrade my electronics for FREE! I have drawn a few submissions for threadless in the past but not had the right equipment to actually submit them! This would be so amazing! I LOVE Threadless for printing designs that ANYONE can submit!!! Thank you! I am still very new and haven’t fully set up my shop. This would be of great help. i have my hopes up! I’ll give it to my brother. He’s quite the artist. He’s getting married in a few months too. This would be a good gift. Plus, he’s an Apple fan. Wow! Awesome prize pack! Am just getting my artist shop off the ground and this would be lifechanging! Out of all these awesome items, $1000 of my shop merch would be my favourite! Not having the funds to get printed proofs for product photos is holding me back. All my fingers are crossed. My 2010 mini notebook just finally died. This would make my business. Thanks for the opportunity!!! Thanks for the chance to win an iPad!!! The year subscription to Adobe creative software is worth it alone. This is a great set up. Especially for artists just starting. Yet, it’s relevant for seasoned artists as well. Good luck everyone! This would be a Life Changer !!! This is beyond amazing!! Thank you threadless crew for offering up such an awesome prize pack for us creative folks!! You guys and gals never cease to amaze me!! Good luck to everyone who entered! Good luck to all the artists here. Gotta love this one ! THANKS! for the wonderful chance at winning this prize! I need this tech upgrade SO much! Thank you so much for the opportunity to win an incredible prize. I miss doing art, would love to do it again. Cool contest, I hope I win. 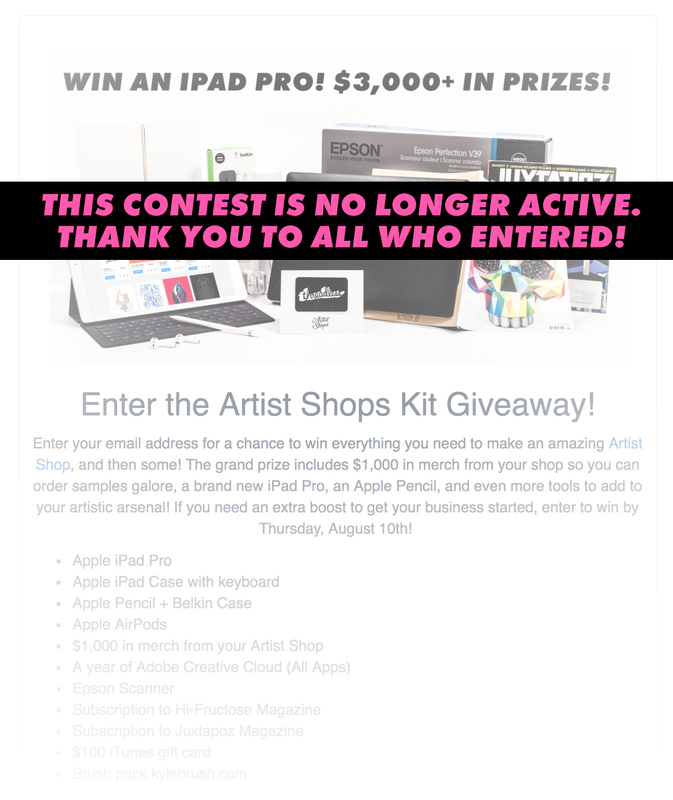 What a prize for those of us who love to be creative….thanks for the opportunity to win this fantastic prize! This win would help me to excel in my passion of art! You guys are awesome for giving someone this chance. Although I hope I win, I would be happy for anyone to win this. Awesome contest! Thanks for the opportunity. This is an International Giveaway? WOW, fabulous giveaway, just hoping to win. I’m new to this… Hope I win…..
Been wanting one of these for along time.. Maybe someday I will be lucky.. Thanks for the chance! Great giveaway…thanks…could sure have fun with this prize… would be happy to win any prize. I would love, love, love this! Wow, what a sweet prize! Good luck dudes! Amazing opportunity for whoever wins this! !, hope I can win! How nice it is to have found this. Thanks “Sarah Johnson” for the heads up! Good luck everybody! Can i win this please…..please….please…..please……..Amazing Gadget. Beautiful giveaway, thanks for the opportunity. I need this soooooooo bad ! Grandbabies get the art supplies, Grandma gets the iPad! Adobe cloud with all the apps!? NICE!! Plus the ipad pro!? BRILLIANT and AWESOME! I’m in!! Thank you so much for the opportunity!!!! Good luck to you all 😍🍀🤞🏻🍀🤞🏻🍀 What a blessing this would be!! Welp, I’m here cause I am desperate. TvT winning would be really a dream come true for a poor girl like me. I’ll be waiting for the results. I really could use it. Truly a great prize to win. I love the site and it’s products. Thanks for the chance! I truly love your products and services. This will seem very useful to me because I’m studying to be a graphic design designer. I would love to do this kind of stuff! Thanks for the chance at winning! Winning would be awesome for me and especially my wife who homeschools our boys. All of these items would be put to great use for our family! Will definitely help complete my home Digital Design business. We haven’t heard back from the winner yet. So we may be picking a new one very soon. Can you announce the winners name publicly? It’s possible your responses have just gone to spam/trash. Hi could I please have 6 iPad pros please it is for my family thank you. I am very excited for a new ipad with lots of stuff. I hope I can effort it to get a new ipad!!!!! Thanks for sharing your thoughts on cara mendaftar judi bola online.